Premier slings come in a wide array of styles to meet a variety of client needs. The Universal High Plus sling is a secure, easy-to fit general purpose sling, designed for the majority of sling users. Use the Universal High Plus sling for residents who are totally dependent, partially dependent, non-weight bearing, very heavy or have limited head control. Use this sling when transferring the resident from the bed to a wheelchair, recliner or showerchair or from the floor to a bed. The large opening also accommodates toileting. 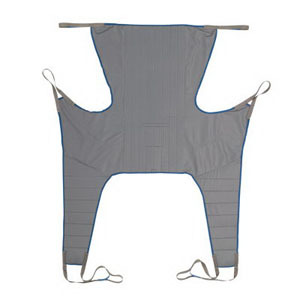 This versatile sling provides full head and neck support and can easily be removed or applied to a resident in a seated or supine position. Solid fabric has extra padding for residents with delicate skin.